Most people have heard of blood diamonds. They’re mined in war zones, often by children, and sold to finance insurgencies, terrorism or warlord activities. In the early 2000s, diamond-producing African countries led an effort to create a system that tracks diamonds from the mine to the market and regulates the policing surrounding the export, manufacture and sale of the gems. Now, at your local jeweler, you can be 95 percent sure the diamond you select did not finance any evils. But … what about every other product in your life? How about T-shirts? Deodorant? Greeting cards? Consumer goods contribute to 60 percent of greenhouse emissions, 75 percent of forced and child labor, 80 percent of water withdrawal and 60 percent of tropical deforestation on the planet. Nearly a decade ago, Arizona State University and the University of Arkansas recognized an opportunity for an organization to come along with a mission to make all consumer products more sustainable. They created The Sustainability Consortium (TSC) in 2009 to transform the consumer-goods industry. By partnering with leading companies, NGOs, universities and government organizations, the consortium works to help companies define, develop and deliver more sustainable products. The organization, which now has more than 100 members, created a science-based system, where research insights into almost 130 product categories are offered to companies. It's a way retailers can work with competitors in a non-competitive way. Companies that manufacture and sell consumer products are starting to pay more attention, because shoppers who do care tend to be vocal and visible about environmental sustainability. They’re demanding more transparency and stewardship from retailers. The work is paying off. Retailers using the consortium's tools include Walmart, Amazon, Sam’s Club, Marks & Spencer and Walgreens. Other pilots with retailers are happening in Germany, Spain and the United Kingdom. “By sharing sustainability measurement tools with large, well-known brands at the hub of the $14 trillion global economy, we’re on an exciting track to influence social and environmental stewardship involving $1 trillion of consumer sales,” said chief scientist Kevin J. Dooley, ASU Distinguished ProfessorDooley is a professor in the W. P. Carey School of Business and a senior sustainability scientist in the Julie Ann Wrigley Global Institute of Sustainability at ASU. of Supply Chain Management. For the past five years, TSC's team has developed a toolkit library with research insights for nearly 130 product categories, from adhesive tapes to toys, root vegetables to refrigerators, wine to wild-caught shellfish. Each industry has specific issues that the consortium works to address. For example, fishing companies may experience “hot spots” related to animal welfare and biodiversity, while corn-oil production impacts smallholder farmers, forced labor, land and climate. Now, about $200 billion worth of consumer products are managed using the consortium’s tools. TSC's 2017 impact report showed that more than 40 percent of suppliers in the Walmart Sustainability Index took action in their own operations and supply chains to improve their scores. The numbers bear up the organization’s impact. • In 2016, more than 2,000 suppliers used category sustainability surveys to report their progress to their retail buyers, a 25 percent increase from the year before. • Those suppliers represent more than $200 billion in sales to their retail partners. • In 2017, these suppliers were surveyed on their experience about responding to TSC surveys. More than 250 suppliers responded, and 40 percent of them replied positively that they had done something tangible to improve their scores by creating internal data collection and communication systems, engaging suppliers, changing products or processes, or beginning to communicate publicly about their sustainability efforts. • To date, 85 percent of consumer goods are covered. • The consortium has received about 3,000 science-based citations. • More than 600 suppliers have been trained. • More than 200 global organizations have been convened for over an average of 75 networking opportunities annually. It's not just suppliers and retailers whose behavior changes are targeted. The consortium and the American Cleaning Institute have developed a campaign for millennials to teach them the benefits of using cold water in laundry. That campaign will be rolled out at ASU this month. What: Each year, the Sustainability Solutions Festival convenes the planet’s top sustainability events and organizations for the month of February to discover and explore how we can individually and collectively reimagine our lives and planet — through education, communication, innovation, transportation and recreation. Dooley will be among a diverse group of expert voices presenting during the event. When: Various dates through February. Dooley's talk, “Selling a Better Future: Changing Consumer Behavior in Sustainability,” is 8:30-10 a.m. Wednesday, Feb. 7, at the Memorial Union's Alumni Lounge on the Tempe campus. Where: Various locations on and off campus. In the wake of Earth’s hottest year on record, the effects of climate change are more apparent than ever. But how do we come to grips with what climate change looks like for real people in actual places? Individuals may submit up to one work of short fiction under 5,000 words. Work will be selected and judged by New York Times bestselling author Kim Stanley Robinson. The winning story will receive a $1,000 prize. Selected work will be published in an anthology by the Imagination and Climate Futures Initiative. 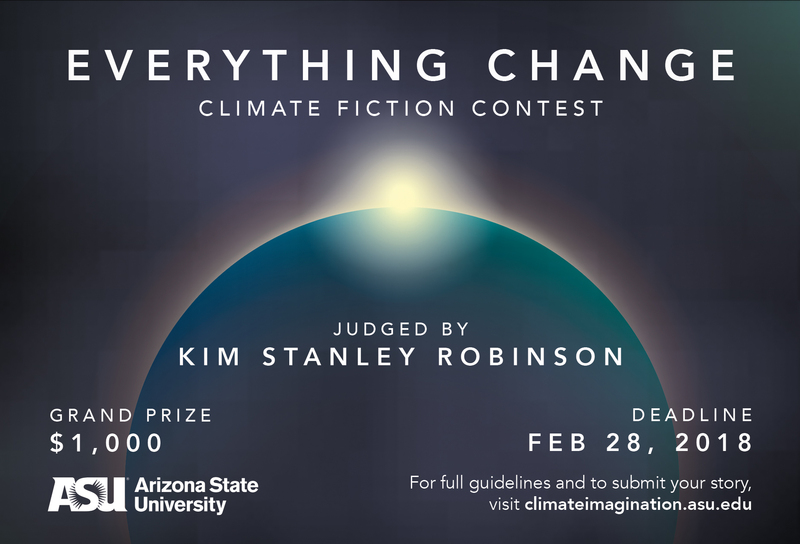 For more information and guidelines, or to download a postcard or flier, visit the contest website at https://climateimagination.asu.edu/clificontest/. The submissions page can also be accessed directly at https://everythingchange.submittable.com/submit. Last year’s anthology can also be downloaded for free.